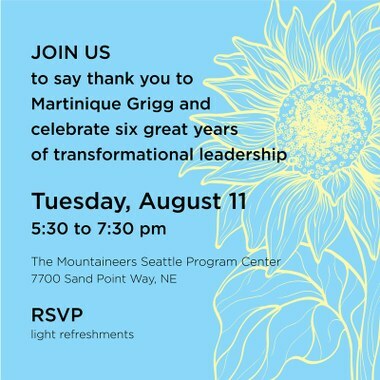 Join us August 11 to thank Martinique for six great years as executive director of The Mountaineers. Mark your calendars and join us Tuesday, August 11, from 5:30pm to 7:30pm to say thank you to Martinique and wish her well as she contemplates her next professional opportunity. All members are invited to her THANK YOU party, which will be held at The Mountaineers Seattle Program Center. Light refreshments will be served. Our program will officially start at 6pm. You can RSVP here, OR you can RSVP to Karen Kirsch by sending an email to development@mountaineers.org. Thank you! For more information about Martinique's transition, you can read her letter here. And to read more about next steps, please check out Board President, Dan Lauren's blog.